One night a few months ago, a terrible thing happened. I went to put on my eye cream–at the time, I was using the Su:m37 Secret Repair Concentrated Eye Cream–and discovered that I’d scraped the entire jar empty. 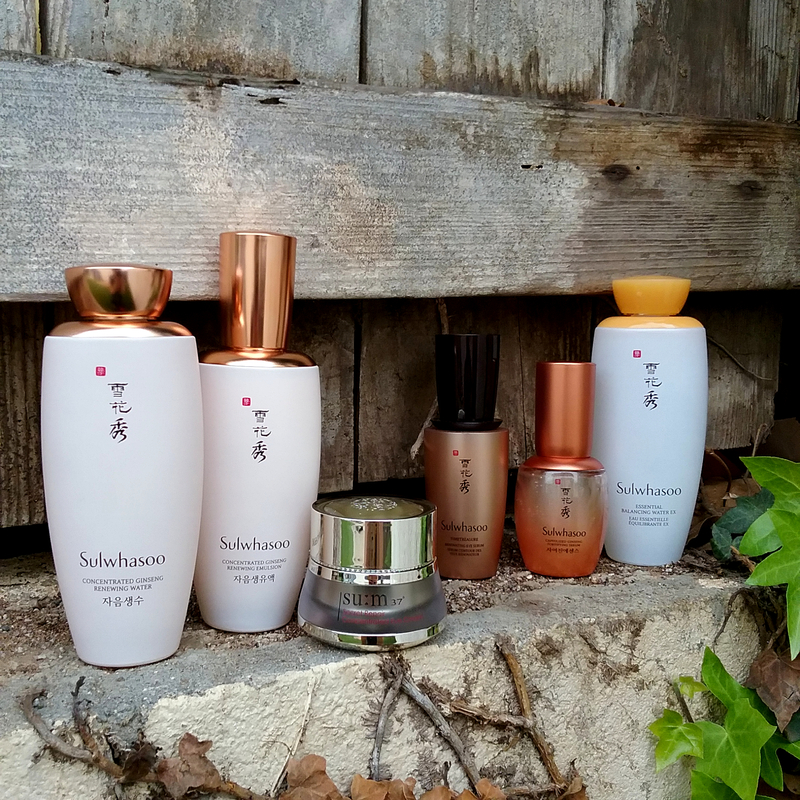 It was the latest in a long line of fancy hanbang products to bite the dust under my loving care. I further discovered a distinct lack of other eye creams in my beauty product black hole of a “linen closet.” Nor did I want to use whatever face cream I had planned for the evening around my eyes, for reasons we’ll get into below. The only product on hand that seemed remotely suitable for my eyes was my COSRX Advanced Snail 92 All In One Cream, so in a fit of desperation, I went for it. And then the next morning I was so pleased at what I woke up to that I went for it again. Then I went for it that night, and again the next morning. And so time passes and here we are today, with me still gleefully putting snail on my eyes morning and night. This post contains affiliate links, which allow me to receive a small commission on purchases made by clicking those links. Affiliate links are marked with an asterisk(*). Is eye cream even necessary in the first place? Skincare enthusiasts have been debating this for years and will probably never stop. I mean, if you think about it, no skincare is really necessary. We don’t really need retinoids or acids or vitamin C serums or hydrating toners or sheet masks or face creams to live. For those of us who enjoy taking care of our skin and enjoy seeing our skin condition and appearance improve to the best it can be, though, yeah, I think dedicated eye products can make a difference. The skin around our eyes tends to be thinner, more delicate, and more prone to dryness than the skin on the rest of our faces. Thinness and fragility and dryness can quickly lead to rough texture, crepiness, sagging, fine lines, and wrinkles. If we want to avoid those outcomes, we need to keep our eye area moisturized and protected. “Okay, so just use your regular face products and face cream around your eyes,” the argument against eye creams goes. I’m fussy about eye products; I think my success rate with them is the lowest of any category of skincare I’ve tried over the past few years. Offhand, I can think of exactly one serum-type eye product I’ve loved (Amorepacific Intensive Vitalizing Eye Essence). The only two eye creams I’ve cared for enough to remember are both really, really pricey–the Su:m37 Secret Repair Concentrated Eye Cream is generally around $75, and Sulwhasoo Concentrated Ginseng Renewing Eye Cream is over double that price. Eye creams last almost forever since you only need a tiny smear at a time, but that’s still a lot to drop at one time when one has been willfully blind to the steadily decreasing amount left in the current jar. So why did I end up reaching for the COSRX snail cream, out of all the creams I did have on hand? I have a few criteria for eye creams. One is that they can’t be excessively perfumey. I don’t mind a bit of fragrance in my eye cream, but too much or the wrong kind, and my eyes will be itchy and red like it’s hay fever season. Two is that my eye cream can’t be too rich. I have lash extensions, and oils will weaken the glue and cause them to fall off faster. Three, my eye cream has to sink in quickly, without any residue that might make my eye makeup slide around or smear off. And four, my eye cream has to somehow be lightweight and non-oily, yet moisturizing enough for my now 39-year-old eye area. It’s a lot to ask from one product. 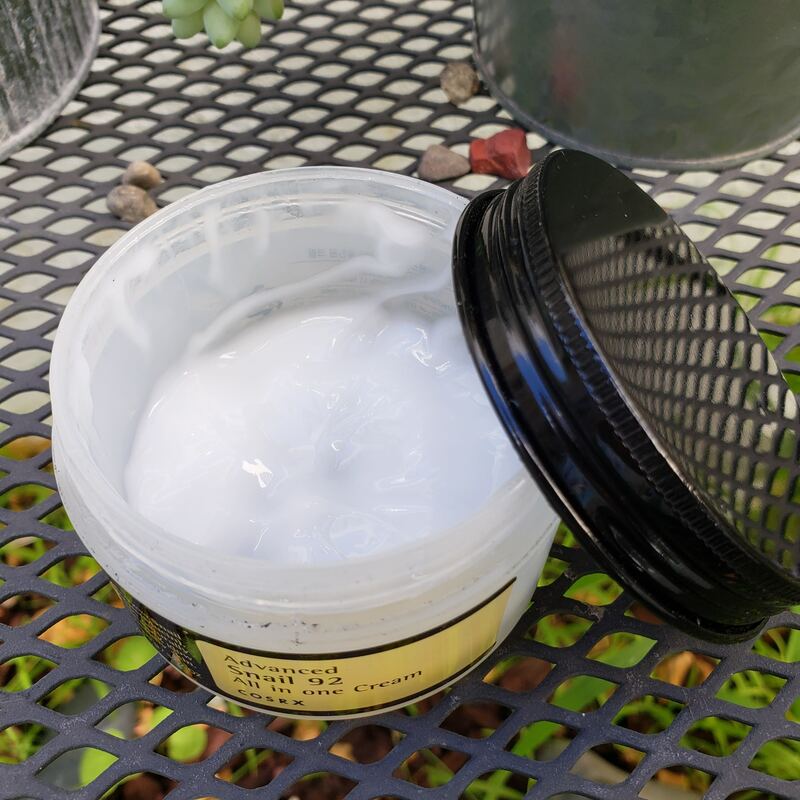 I had my doubts that the COSRX snail cream would provide enough moisture, but it was the only cream in my stash that seemed to hit my other requirements, particularly my need for a non-greasy and non-perfumey product, so on my eyes it went. Before getting into what this cream did for my eyes, I need to be up front. If you’re looking for an eye product that can shrink puffiness, reduce undereye bags, or fade dark circles, the COSRX snail cream is probably not it. I don’t have significant puffinessnow that I’ve reduced my sodium intake, undereye bags, or dark circles (at least, I don’t think so? ), so I can’t speak to whether any products help with those concerns. My eye area concerns are pretty simple. I want to keep the skin smooth and firm and minimize those pesky undereye fine lines wherever possible. That’s what I look for in an eye cream, and that is, happily, exactly what COSRX Advanced Snail 92 All In One Cream delivered. All in one big, inexpensive tub of moderately slimy goodness. 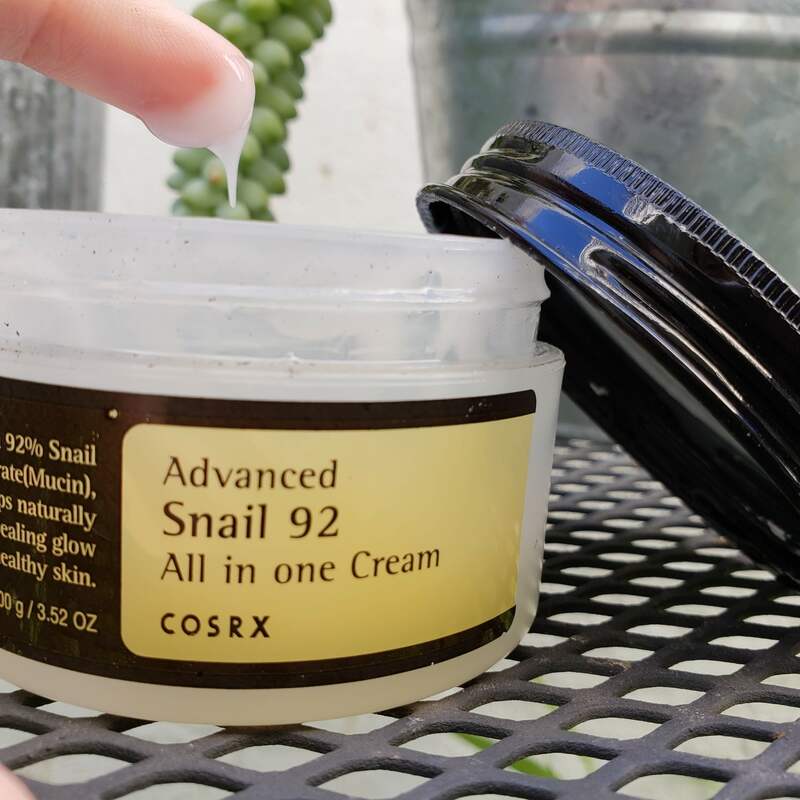 With snail secretion filtrate making up 92% of the product, per a conversation I had with COSRX, it’s worth it to have a quick refresher on why snail mucin matters. Snail secretion is humectant, emollient, antimicrobial, antioxidant-rich, and contains collagen, elastin, and cell communication-facilitating glycoproteins, among other skin-friendly components. It may have wound healing abilities and shows promise for the repair of photoaged skin (snail is the star of my post-sun skincare routine) and atrophic acne scarring. At minimum, therefore, snail slime is a lovely natural moisturizer. It may also have long-term anti-aging and skin-smoothing benefits. In fact, I did see benefits beyond moisture after using the COSRX Advanced Snail 92 All In One Cream around my eyes for a few weeks. I remember getting ready one morning, looking in the mirror in the fairly harsh and unflattering morning light in my bedroom, and pausing for a moment when I realized just how smooth my undereyes looked. I’m used to a few fine lines in that area, but the same light that showed me exactly what looking down at my phone has done to my neck was also showing an eerily crease-free eye area. I’m starting to see an increase in firmness in my upper eyelids as well–the crepiness that was starting to creep in seems to have receded. I’ve found a winner. One that won’t hurt my bank account very much to replenish. As far as user experience goes, the COSRX Advanced Snail 92 All In One Cream performs beautifully. While the slightly slimy consistency of the cream may take some getting used to, it applies smoothly and sinks in quickly. It hydrates and moisturizes just enough and leaves no greasy residue to interfere with my lash extensions or makeup. There’s no fragrance and nothing else in it that bothers my eyes. I dab a little bit on in the morning and a bit more at night and use no other eye treatments besides the occasional eye mask. Considering my eye area’s tendency to favor really expensive products, I’m beyond happy that the COSRX snail cream has worked out so well. As an extra bonus, since the cream works well as a light face moisturizer too, it really is “all in one.” It took me an eye cream emergency to get here, but I’ve found a real winner. 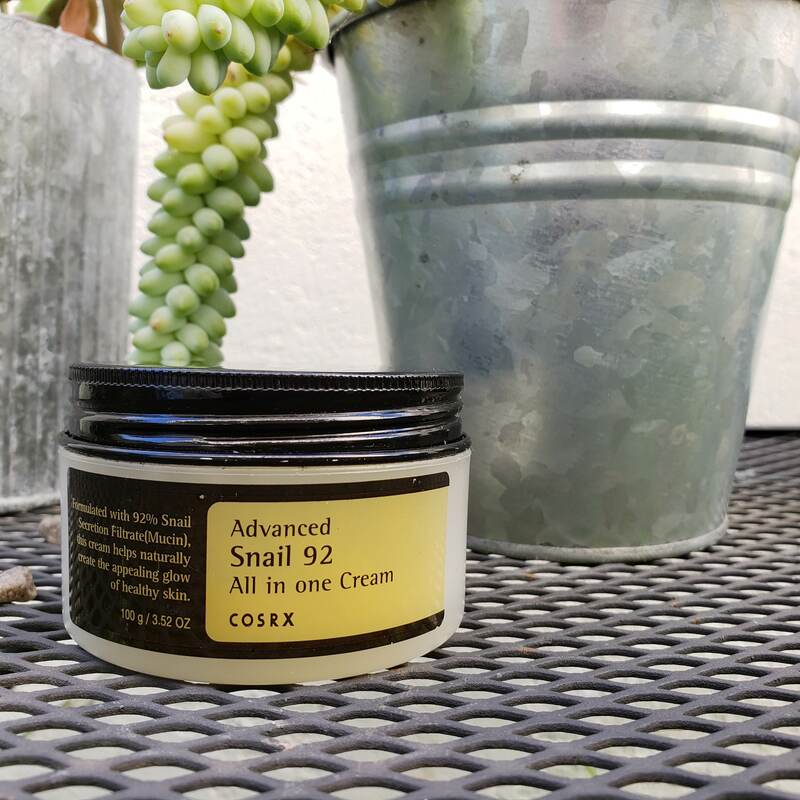 Where can I buy COSRX Advanced Snail 92 All In One Cream? COSRX is available just about everywhere these days, but personally I think Amazon* is easiest, and the price is right. For non-US addresses, YesStyle Global* has it! Great idea! I bought this to use on my face but usually don’t use it so I have a jar of it just sitting there. I’m traveling right now, so I’ll try it as soon as I get home. Thank you for sharing!! I have often found myself lazing through the COSRX Snail Cream on my eye area when I am just not in the mood for putting myself through a multitude of steps; laziness really. And I have also reached the same conclusions as you tbh. This cream actually is all in one. But what about the Mizon Snail repair eye cream? Its snail AND a multitude of other products. Just curious to know what you have to say. I don’t like the Mizon quite as much for exactly the reason you stated–that it is a multitude of other things too. I really look for snail products that are pure play snail rather than taking up product volume on other ingredients that I can find elsewhere! Their snail repair eye cream is a decent starter eye cream but the effects for me were nothing like this. I did try Mizon snail repair eye cream and it just isn’t very moisturizing. I’m still using it up and have to apply it more than once as it just seems to disappear and my eyelids feel dry. I also recently bought Benton’s Fermation eye cream and it IS a bit better, but I’m still not thrilled with it. Honestly, my fav is one I cannot afford and that is La Mer’s soft cream. It never stings and leaves my eyelids with the perfect amount of moisture. I buy the sample sizes off ebay as it is far more economical. I’m dying to get home and try the snail cream to see how that works on my eyelids. One thing I know for sure is it will not sting. That is what I LOVE about the Cosrx 96 snail mucin and the 92 snail cream. Jude, thank you so much for starting this blog. I stumbled upon it while doing a google search for sunscreens. I have had outstanding luck with the products you suggested. The Biore sunscreen is the first one I have ever tried that did not make my skin itch and break out. It was also the first one that didn’t have a strong smell. I, like you, was heartbroken they changed the formula. I bought a lot of it before the change so am working through my stash while looking for a new one. I wasn’t crazy about the Apeiu, but am ordering the Missha Aqua sun gel you showed on your instagram. I also ordered what looks like a Biore knock off down to the packaging called “Rohto SKIN AQUA SARAFIT Essence UV (SPF50+ PA++++) ” I’ll let you know how close it is to Biore. Really glad you’re back, Jude!!! And thank you for all the GREAT guidance on skin care. I’m now passing on your advice to friends. Can I use this as an all over moisturizer for both my face and eyes? How is it as a moisturizer for the face? You sure can use it all over! For face, I love it as it’s a lightweight moisturizer that makes my skin super duper velvety soft. What do you think about the essence version? Would you say it has the same strength as the all in one cream? The essence doesn’t have the emollient ingredients that make the cream good as an eye cream!